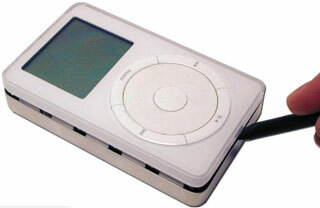 Apple's iPod has been wildly successful; even though it was neither the first handheld MP3 player (models such as the Diamond Rio were first with flash players) nor the first to feature hard drive storage (Creative's Discman-sized Nomad Jukebox predated it), the iPod's combination of clean design, easy to use software both on the player and the computer, and the growing ecosystem of third-party add-ons have all contributed to Apple's 80+% market share. These complaints have gotten lots of media attention - some might even say too much media attention. All lithium-ion batteries fail to hold a charge after a couple of years, and while the iPods are hard to open, the batteries can be replaced. Another issue is lurking in the background, however. I don't have any statistics on how widespread it is, but my personal experience suggests that it may be affecting huge numbers of owners of hard drive-based iPods. The symptoms appear to be a hard drive failure; the iPod tries to start up, but part way through there are several clicking sounds, like a computer hard drive that has crashed, and finally a "sad iPod" icon (right) appears on screen. This is not a rare occurrence. I know five people who bought 40 GB fourth-generation ("click wheel") iPods. Three of the five have had this happen to their iPod; one person had it happen while her iPod was still under warranty. Apple replaced it; later, the same thing happened with the replacement unit. The other two iPod's failed after the standard warranty ran out, suggesting that it may be worthwhile to budget for the extended AppleCare warranty, at least for hard drive iPods. Apple's iPod support page gives steps users can try if their iPod doesn't start; maybe they work for some users, but they haven't helped the people I've known with these problems. Contacting Apple's tech support about an out of warranty iPod can be frustrating. Their advice: Pay to ship it back to Apple and pay to have them replace it with a reconditioned replacement. That's too expensive; you might as well just ditch it and buy a new one - and I suspect many people have done just that. Unnecessarily. 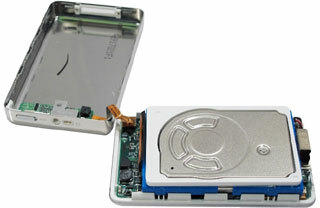 Certainly hard drive failure might seem like a possible explanation - like laptop hard drives, the iPod's 1.8" Toshiba drive certainly gets bounced around a lot. These drives are available from computer shops; I was quoted a price of C$155 for a 40 GB 1.8" Toshiba drive from my local computer store. And replacing the hard drive wouldn't be much more work than replacing the battery. In fact, I tried replacing the hard drive in one of these problematic iPods; the new drive didn't seem to make any difference. Nicely, my vendor let me return it. Instead, the problem often lies elsewhere - and is less expensive to fix. But it still requires opening the case. I've never been able to make the nylon tools work for me. Instead, a small slot-head screwdriver works, though I have to admit to leaving a few scratches on the chrome. I've had the best results starting on the side to the right of the display panel, and with one hand squeezing the top and bottom while trying to slip the screwdriver between the plastic and the metal shell. Once you've got the screwdriver in at one point, you can move it around the case, gradually prying it open (as in these illustrations from Newer Technology's battery replacement manual). Once you pry the case open, gently turn everything face down; you'll see the iPod's hard drive in the plastic shell. You can (again gentle and carefully) lift out the hard drive, turning it upside down. 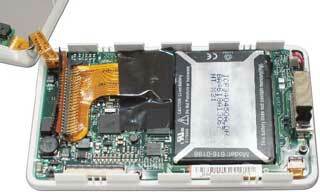 You'll note that there's a wide ribbon cable that plugs into one end of the hard drive. Check to make sure the connector is firmly plugged into the drive - but that's not usually the problem. Look at the other end of the cable, underneath the hard drive. There a piece of black tape presumably holding the other end of the cable in place. Lift the tape; the end of the cable fits into a connector. There are no pins plugging into sockets - the cable just sits, more or less snugly in a connector on the iPod's logic board. Several times I've found that just pressing the cable-end in a bit was all it took to bring the iPod back to life. Then replace the black tape, put the hard drive back in place, snap the back on again, and you're back in business. It doesn't always work; when it didn't work on my daughter's iPod, I brought the iPod to Eric Dressler, a local freelance iPod repairperson. He did the same thing I had tried, but completely removed the cable and reinserted it in the connector. His touch was better than mine, and the iPod has worked ever since. A loose connector. Or given the number of people I've run into with the same problem, a plague of loose connectors. According to Dressler, "I see a lot of iPods that I have to reseat or replace the cable. I am unsure if this is a 'product flaw' or if this problem is happening mainly due to people dropping their iPods." He adds, "The black tape inside does not really do all that much, I think it is meant to hold down the arm that holds the cable down, but usually the arm is not raised when I open the iPod. In fact, the cable even looks as if it is seated properly. "I honestly find Apple's repair strategy on these to be comical, as I work for an Apple service provider as well and am a fully certified tech. I think Apple has really dropped the ball on any warranty issues customers have. This is a common problem, but at least nothing actually fails inside of the iPod when this happens"
He warns, however, "iPods are very sensitive devices. I see a lot of people who attempt to repair their iPod or replace a battery only to damage it. I do not recommend opening the iPod if you are not familiar with taking small sensitive stuff like this apart. I worry that a lot of people may try to repair their iPod themselves and damage them."